Weipa Camping Ground is 13 acres of lush green lawns abounding in shady trees on the shores of the beautiful Albatross Bay. As the park is situated on the beach, the afternoon sunsets provide a picturesque backdrop for an enjoyable stay. The tropical pool with waterfall provides a cool option for all those wishing to get out of the heat. The Weipa Caravan Park & Camping Ground also has a laundromat, sells ice, local-bred meat packs, bait and gas and has an on-site takeaway shop. 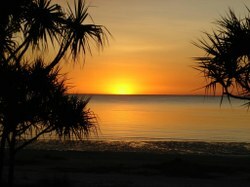 The Weipa Caravan Park & Camping Ground offers a range of accommodation, from unpowered camping to self-contained beachfront accommodation, with prices ranging from $35 per night (twinshare) to $200 per night (twinshare). Copyright 2015 Cook Shire Council. All Rights Reserved.